Every programmer loves to reinvent the wheel, and reinventing the wheel is still my primary hobby. Sometimes you need to reimplement a Network protocol to use with your favorite language/library, sometimes is only for fun, but if you're in the Business World maybe is "better" (faster) to use one of the thousand existing libraries. In the most cases you need to reimplement a Protocol to embed it in your application, and sometimes you have to reimplement two/three protocols that does the same job like IM Protocols (XMPP, AIM, Yahoo...). A better solution, that avoid you to reinvent the wheel is to use an existent library to handle the protocol(s) that you need, and build an Abstract Interface, with your data format, that allows you to use a generic way to communicate between various provider. Below you can find a graphical example of what I mean. You can have many providers, written in different languages. 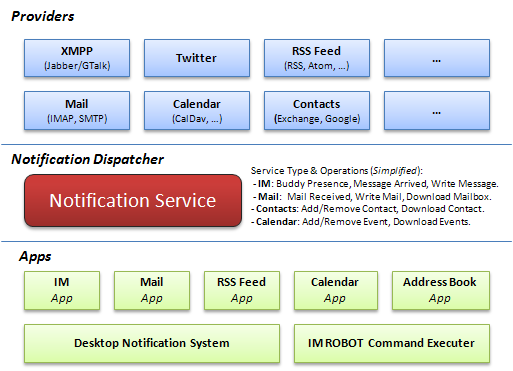 These providers talk with the Notification Service providing an abstract interface for the Apps. In this way, the end App has just to say "Write a Mail To X", "Download Todays Mail", "Send an IM to X"... and you can intercept notification to displays as a popup on your desktop... or something similar. This solution will be used in MokoTouch Project, to provide Core Services to the Apps. For more information send me a mail.